The European Space Agency‘s Rosetta spacecraft is a unique mission to rendezvous with, orbit and land on a comet. Reaching the comet far enough from the Sun that it is still inactive, it gives us the chance to study the whole cycle of an active comet, and hopefully provide new insights into the early stages of the formation of our own Solar System. Launched in 2004, Rosetta has been performing an intricate celestial ballet, pirouetting around the Solar System to catch up with comet 67P / Churyumov–Gerasimenko as it swoops towards the Sun, which it does every six and a half years. 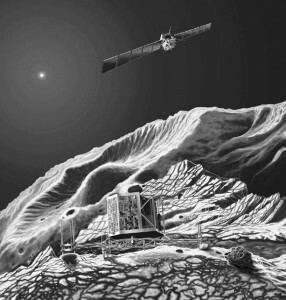 The mission has two main components – an orbiter, which will intercept and follow the comet in its passage through the Solar System, and a lander, which will attach itself to the surface with a harpoon before the comet is active and make detailed in situ measurements of the landing site and surrounding surface. On-board the orbiter are 11 instruments provided by a variety of institutions from around the world. Three of these are dedicated to the measurement of cometary dust and aim to measure its size distribution, physical and chemical composition. GIADA will measure the number, mass, momentum and velocity distribution of grains emitted from the comet. COSIMA collects dust grains, inspects them with an optical microscope, and then uses a secondary ion mass spectrometer to measure the molecular, elemental and isotopic composition of grains. MIDAS also collects grains on one of 64 targets, which can then be scanned with a powerful atomic force microscope (AFM) to examine their structure with extremely high resolution. 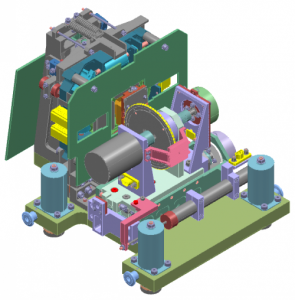 Dust is collected via a funnel protruding through the “front” of the spacecraft and comes to rest on one of 61 specially coated collectors (facets) on the outside of a sample wheel, as see in the drawing of the instrument innards. Once collected, the wheel is rotated so that the facet is directly in front of the microscope stage. 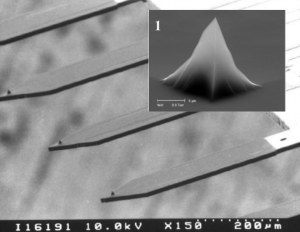 Although the facet is rather small (1.4 x 2.4 mm), it is enormous compared to the range of movement of the microscope itself, which can scan up to 100 µm. The principle of an AFM is something like that of a record player, in which a sharp needle is moved over the surface and its deflection recorded to reconstruct the three dimensional shape of the object. MIDAS can operate in such a mode, but the dust particles are expected to be rather fragile and could be broken or distorted by the tip. To avoid this, many AFMs including MIDAS have a dynamic mode, in which the cantilever (the springboard-like structure on which the tip is mounted – see the picture) is oscillated. When very close to the sample, the tip “feels” the sample even without touching it, due to various forces acting between the two (electrostatic, magnetic etc.). This changes the resonance frequency of the vibrating cantilever, which is detected by the electronics and used to detect the surface. By moving the tip towards the sample at a grid of up to 512 x 512 points, a 3D image is created. By learning the detailed shape and size of cometary dust particles, we hope to learn more about how they formed, and how they aggregate together to make larger “fluffy” particles. In addition, MIDAS has a magnetic mode which should allow us to detect magnetic inclusions in the collected particles.